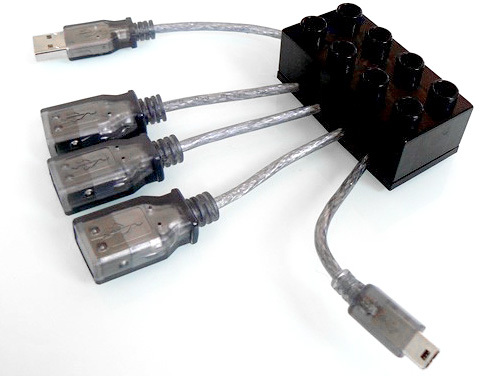 4 Port USB Hub Crammed Into A LEGO DUPLO Brick | OhGizmo! Because regular LEGO bricks are only so big, it limits the types of technologies that can be crammed inside. So while LEGO flash drives are not uncommon, that’s where the innovation has kind of stopped. But everyone seems to have forgotten about DUPLO, those giant, hard-to-swallow, kid-friendly LEGO bricks that most of us probably started with as a toddler. Everyone except Etsy seller 123smile that is. They’ve managed to retrofit a DUPLO brick with a 4 port USB 2.0 hub that includes 3 x USB type A ports and 1 USB mini port for good measure. And just like DUPLO, the hub is available in blue, orange, yellow, red, green, white and black colors. But unlike a single DUPLO brick, it will set you back $49.95. Looks like my soldering gun just paid for itself. Looking like a usb cable but not to be digested easily.